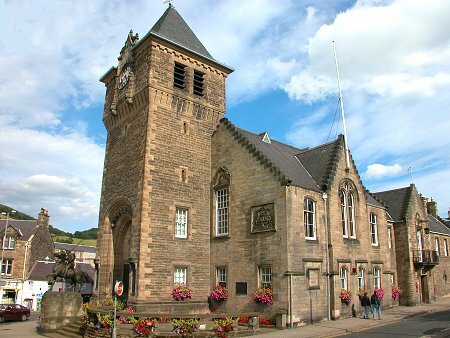 Galashiels is a busy town on the A7 road from Carlisle to Edinburgh. It lies in the bottom of the steep-sided valley of the Gala Water a mile upstream of its confluence with the River Tweed. 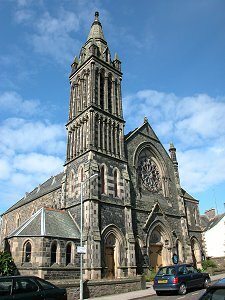 Though the town has worked hard to diversify in recent years, Galashiels' history has been closely tied to the fluctuating fortunes of the textile industry in the Scottish Borders. The A7 splits as it runs through Galashiels, forming the one way system surrounding the town centre. 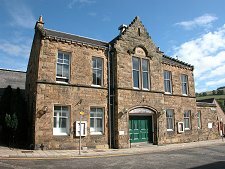 Overlooking the junction where the road comes together before heading south to Selkirk is the town's most striking building, the Burgh Chambers. 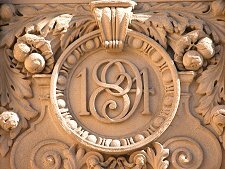 Originally built in 1867, the impressive clock tower added in the 1920s incorporates the town's war memorial and includes a beautiful statue of a mounted border reiver. 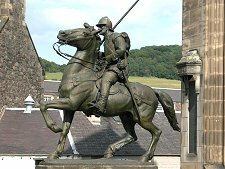 Galashiels' war memorial was built to remember the 635 men from the town killed during the First World War, a remarkably large proportion of a pre-war population of 14,500. Opposite the Burgh Chambers in Cornmill Square is the Cornmill Fountain. This remarkable structure makes use of the old lade from a demolished corn mill on the site to accommodate a fountain and an unlikely variety of statues, including boys riding dolphins: all virtually hidden from view by the surrounding balustrade. The fountain also carries the town's coat of arms: an image of a fox trying to pick plums from a tree with the motto "Soor Plums". The meaning of this will evade even the luckiest guess. It dates back to an incident in 1337 when a party of English soldiers, resting nearby after picking and eating wild plums, were surprised and defeated by townsfolk. The main core of Galashiels lies along the line of the Gala Water and mostly to the south of it. Three parallel roads, Overhaugh Street, Channel Street and Bank Street come together to continue west as two, Bridge Street and High Street. 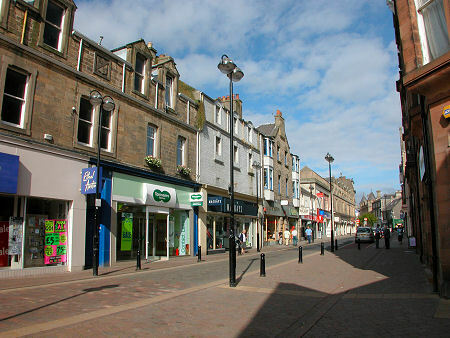 Channel Street and High Street contain most of Galashiels' interesting collection of shops. 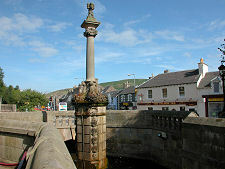 The Gala Water is bridged at the two ends of the town centre, by Bridge Place and by Market Street. 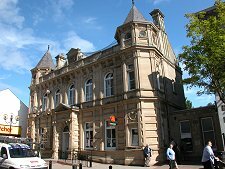 The population of Galashiels declined in the late 1890s following problems with trade to traditional markets in the USA, and stood at 13,600 in 1901. 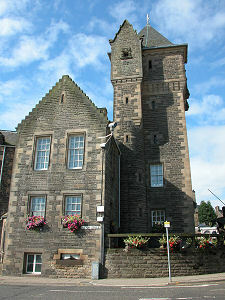 The slow growth over the following decade followed improvements to Galashiels' environment, and the construction of a secondary school and a technical college. 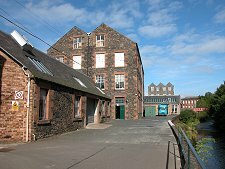 In 1998 the town's Scottish College of Textiles became part of Heriot-Watt University allowing Galasheils, for the first tme, to benefit from its own university campus. 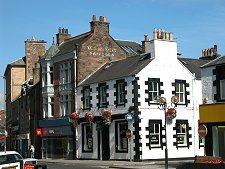 Today's Galashiels has successfully diversified away from its old dependence on textiles. 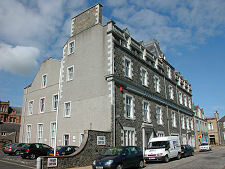 One sign of this is found in the large headquarters on Bridge Street of Scottish Enterprise Borders. Elsewhere in the town, companies have set up engaged in fields as varied as medical research; software development; the production of leather clothing; and fish processing. And Galashiels has also very successfully improved its transport links in recent years. The "Waverley Route" railway from Carlisle to Edinburgh via Hawick and Galashiels opened for business in 1849. Galashiels Station was closed in 1969 with the rest of the line, but in September 2015 part of the route came back into use when the rebuilt "Borders Railway" opened, linking a new transport interchange in Galashiels with Edinburgh.